From my monthly blog at Patheos Pagan. People did not live long-term at Gobekli Tepe, they traveled there for whatever sort of rites were done, and it’s interesting to think that pilgrimage, travel for religious reasons, seems to predate civilization. In order to make spiritual progress, we have to keep shaking up our neurological patterns, and from the Islamic Haj to Zen monks wandering like “clouds and water” (unsui), travel is an excellent way to do that. And it strikes me that the circuit of summer Pagan festivals provides something along this line. Pilgrims come from hundreds, even thousands, of miles to places like to Ramblewood and Wisteria to form periodic communities, temporary autonomous zones that appear, disperse, and reappear. The idea also applies in some degree to Burner events (Burning Man and the official and unofficial “regional” Burns) and even annual music festivals — and the emergence of music festivals that deliberately include some aspect of consciousness-raising is an interesting development — but I’d like to stick with festivals that identify as “Pagan” or “Pantheist” or “Magical” in some way here; specifically my “home event”, the Free Spirit Gathering, from which I’ve just returned. I’ve been involved with FSG since 1998, in roles ranging from kitchen help to President of the Free Spirit Alliance, the 501(c)3 corporation that produces the event each year. So I can’t offer anything like an unbiased review. What follows are some personal musings and a bit of a look behind the scenes. Friday Night Fire Circle at FSG 2014. Photo by Vann Godfrey. 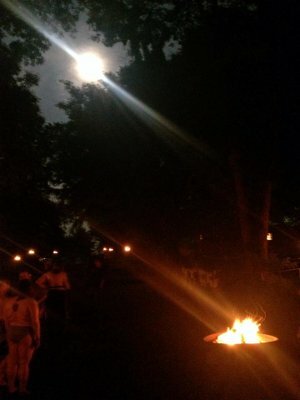 I repeated my role as Master of Ceremonies for the festival, a position for which I literally wrote my own job description last year, keeping the energy flowing between our large group rituals, our concerts, our Bardic Circle (like an open mic with a spiritual mission), and our nightly drumming and dancing Fire Circles. With the rainy weather it was the Fire Circles that took most of my focus, but with indefatigable folks working setup and a Fire Crew who can make anything burn regardless of the weather, we overcame all obstacles and once again made mankind’s oldest magic. The theme for this year’s Gathering was “Home is Where the Hearth Is”, and so it seems appropriate that the images that stick in my mind from this one involve fire. Watching the firelight reflect in a rain puddle, drops falling almost in time with the drums; dozens of performers in a ring around a candle, a symbolic flame, at the Bardic Circle; or coming down to the remains of the fire Sunday morning after working magic until dawn, and finding a score of butterflies sitting on the ashes, basking in the warmth and energy. It was hard work, but I’m proud to have been a part of putting on a great festival. And I learned some important lessons about leadership and trust. However, I’m looking forward to heading to the Starwood Festival in a few weeks, where I will not be responsible for anything other than teaching a few workshops! Scham, Sandra. “The World’s First Temple.” Archelogy, Volume 61 Number 6, November/December 2008.